Stylish, elegant and fiery: Fuse, the up and coming Dutch sextet, has established a dynamic presence on the musical scene. Founded only three years ago, Fuse has already achieved a distinctive cachet by the end of 2015. It has performed at all the top venues in the Netherlands, and foreign tours are in the offing. Trips to Denmark and Sweden are already planned for 2017. The group, consisting of Emma van der Schalie (violin), Tobias Nijboer (bass), Daniel van Dalen (percussion), Mascha van Nieuwkerk (cello), Adriaan Breunis (viola) and Julia Philippens (violin), has rapidly made its name as an avant-garde ensemble with a growing reputation. Its distinctive fusion of classical and dance music, jazz, pop, rock, funk and even Balkan folk music makes it instantly recognisable. The inspiration that allows the group to keep on re-inventing itself is derived from a medley of different musical styles that have all achieved world fame. Their diverse repertoire ranges from the rhythmic music of Frank Zappa, Britney Spears and Dave Brubeck to works by John Coltrane, Duke Ellington, Nils Frahm (the German pianist and composer of both pop and classical music) and great names from the world of classical music such as Joseph-Maurice Ravel, Dmitri Shostakovich, André Previn, Belá Bartók and the Lebanese violinist and composer Claude Chalhoub - a broad, balanced scale of musical extremes. Fuse's performances include its own arrangements supplemented by compositions and arrangements by others to give a bubbly mix, delivered with unspoiled conviction by the various members of the ensemble whose different playing styles blend to leave an unforgettable impression. "We want our dreams to go beyond the written music." "All the composers we gravitate towards have something special," says co-founder Emma van der Schalie. "Take for example Shostakovich who loved jazz and Bartók who was inspired by the folk music of the Balkans. Actrually, Bartók's "Microkosmos" almost sounds like rock or pop. Classical music and rock can complement each other. What we play is unique within the classical scene, because we rewrite existing pieces completely and incorporate new themes. We are looking for things that really dovetail beautifully. In the end, it's all music, not rocket science. I find the whole process incredibly interesting, because I was classically trained and I was 24 when I joined Fuse. We try to reinvent the music we play as far as possible. We use a lot of elements from the original piece, but add new percussion or other improvisations, like a bass solo. The creative element really gives it added value. We let ourselves go in everything we do, whether it's writing or playing, or organizing events. If we feel we have to jump during a piece, we jump or dance, there are no inhibitions. We look to push boundaries and create a lot of our music ourselves. For the rest, we have a few regulars that we like to work with and who write beautiful music for us, like Thomas Beijer, Tom Trapp and Rob Horsting." "We don't feel the slightest need to just reproduce the pieces. For example, we gave a beautiful piano piece by Previn a new look and feel by reworking it in our style so that every note you hit on a piano gets a competely new sound. Most interpretations by the string sections are kept at a micro level, but we want our dreams to go beyond the written music. Sometimes we pull a piece right apart and put it together again in our way. That's a very different approach from simply giving the best possible interpretation of a written score. I just love that. All we need to do is look at one another and we know what's coming. We have a lot of fun together." "Fuse actually started as a sort of student job to make ends meet," says co-founder Emma van der Schalie. 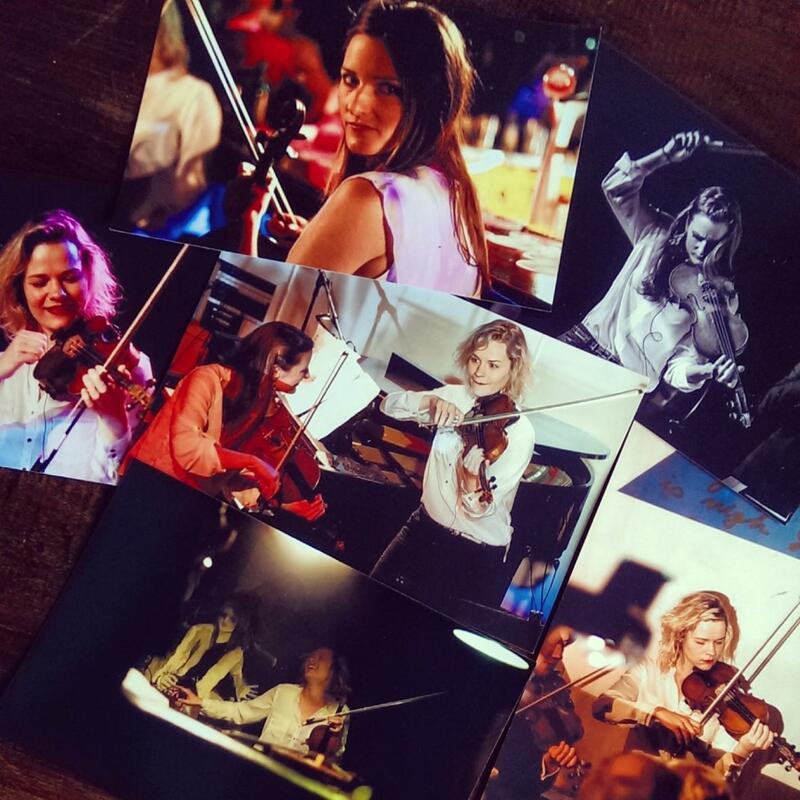 The success formula for the group was dreamt up by the three female band members Emma van der Schalie (violin), Mascha van Nieuwkerk (cello) and Julia Philippens (violin). Emma talks enthusiastically about Fuse's success: "It all began after I finished my Bachelor's degree at the Amsterdam Conservatory. The two years when I was taking my Master's after that were when Fuse really started to take off. In fact, I spent a total of more than 10 years at the Conservatory, starting in the young talent class on my 14th birthday. It was during the Master's phase, when our studies were very practical, that the three of us put Fuse together. We were very good friends and we were often asked to do gigs by people who were looking for a string trio; that's how Fuse was born. We loved playing together, but we also wanted to create our own style." "We started rehearsing intensively to boost our prestige and to develop our own special mix of styles. We played intuitively, driven by the music we wanted to make. Though we didn't set out to be innovative, it appears that our music filled some gaps in the world of performing classical music. After that we began to build our own repertoire and develop our own musical ideas. It wasn't easy to find other musicians who shared our mind-set and musical interests. We played with different line-ups and groupings for eighteen months. We even experimented with a 12-part string section to see if we could grow into an orchestra, but finally we ended up with a sextet. The nice thing is that out of the six of us, three had studied jazz at the Conservatory." "This has been a busy year for Fuse," says Emma, "but between the "gigs 'n fun" most of us have been working our socks off to get our eagerly awaited Master's degrees at the conservatory. Julia (Master's in jazz from Amsterdam) graduated in the summer of '14 and I got my Master's in classical music, also from Amsterdam, at roughly the same time. Drummer Daniel got a quality result in his jazz final in The Hague last month, and yesterday Mascha nailed it with a beautiful concert presentation in a chapel in Tilburg. So now it's celebration time for all of us, and we can't wait for our next adventure!" 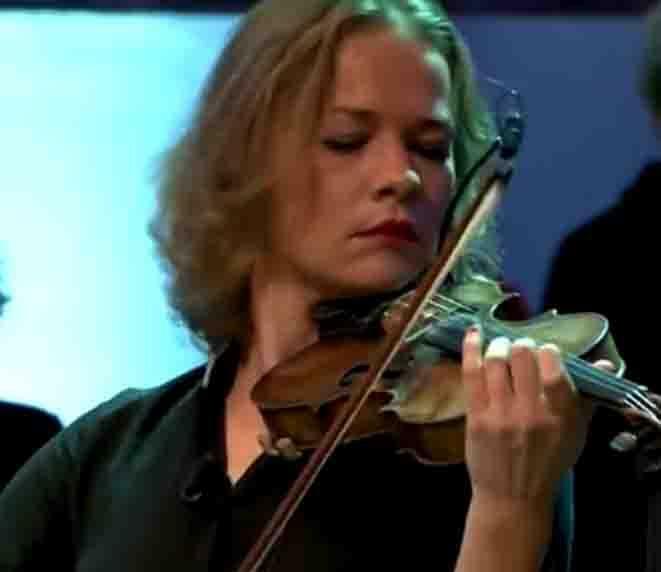 Emma van der Schalie is crazy about music and started taking violin lessons at the age of 6. She remembers it well. With a smile she says: "We had a piano at home, which my mother played, but I had a clear preference for the violin. I really had to nag her to let me have lessons. I got a little violin on my sixth birthday, started taking classes soon after, and got to the final in a music competition when I was 8. I was playing all the time, but it was never boring. I even went to a lot of violin camps: it almost became a kind of high-level sport. My mother always took me to Groningen to see the best string quartets, chamber music ensembles and orchestras and I went to the Conservatory when i was 12." With their bold approach to string music and a matching stage presence, Fuse rapidly became a formation to watch at the cutting edge of the Dutch music scene. They performed more than 150 shows in nearly two years, at a wide range of Dutch venues such as the Rijksmuseum, the Vredenburg music centre in Utrecht, Paradiso in Amsterdam, the Concertgebouw Tracks series, De Doelen in Rotterdam, Classical:Next 2015 (an international classical and art music event held at a different place every year: the 2015 edition was in Rotterdam), the Buma Classical Convention and also in clubs, churches, concert halls and living rooms all over the Netherlands. Fuse became a regular guest on late-night TV show "Podium Witteman" in 2015. They have also featured on Dutch Radio 1, 2, 4 and 6, composed the theme music for the TV show "Opium" and recorded strings tracks for Dutch DJ superstar Oilver Heldens. Other noteworthy performances were at SAIL Amsterdam, the Norton Wine concert series, the Canal Festival (Grachtenfestival) in Amsterdam, the "Entrée" series by the Concertgebouw Herdenkingsconcert in Haarlem, the Wonderfeel festival, a performance in Nieuwe Kerk, The Hague, and the Huiskamertournee ("living room tour", in which the group played in people's living rooms in 25 different cities up and down the country). The six young musicians, with backgrounds in both classical and jazz music, have shown outstanding instrumental and artistic talent combined with a modern, entrepreneurial attitude. Fuse's unusual line-up, a string quartet with double bass and percussion, allows them to develop a unique mix of styles and genres, giving audiences a high-quality, authentic crossover experience. The band also gave a sensational series of concerts under the alternative name Confuse. This was a unique musical experience full of co-creations between Fuse and a diverse selection of guests artists such as dancers, rappers, poets, painters, and other artists and theatre producers. "Those concerts were a real artistic and creative rollercoaster," says Emma van der Schalie. The Confuse series was actually the main driver of our activities for the first two years. We decided this was the best way of getting to play a lot, to get in some real mileage. We did a total of 10 Confuses concerts spread over two seasons, and they really caught on with the public. We grew very fast in a short space of time and acquired a loyal following. After 3 years we knew we had honed our skills to a very adequate level. We started off doing the rounds of the concert halls and then suddenly we were on national television, playing and talking about our music. That was terribly exciting. Now we play at the best venues throughout the whole country. We did a series of living room concerts in the spring of 2015, passing through 25 cities in the process." A loyal audience, the finest venues in the country, rocking on and experimenting to find your own style. That is Fuse, a band that plays styles ranging from rough to subtle and extremely quiet. Emma van der Schalie is deservedly proud. "The song mr Black by Tom Trapp is a rocky piece," she says, "just like Echidna's Arf by Frank Zappa. What's so cool about Mr Black is that it was written specially for us. It's our piece. You won't hear it anywhere if it's not being played by us. It's a truly rocking piece with a 20-string outfit and drums. We feel that we can achieve a lot of synergy if we push the boundaries. Thomas Beijer, a friend, composer and orchestrator, is one of the greatest piano talents in the Netherlands these days, and a very gifted musician. He has written a lot of music for us too. We make music in a way that is both pure and unique. We take a very serious approach and give it our all. We don't just play for ourselves, but we don't try to inhibit ourselves so as not to shock the hyper-sensitive ears of classical music aficionados." “When we're rehearsing a Frank Zappa piece, we take exactly the same approach we would when rehearsing Bartók or Shostakovich. We listen attentively to our recordings and experiment as muich as possible till we've got it right. We try to play each piece in a huge variety of ways. Now and then, we also perform music by Vincenzo Gallilei, the 16th century Italian lutenist and father of the famous astronomer Galileo Galilei. It has a very intimate feel, almost like church music, with such a wealth of harmonies and beautiful twists and turns that we just love to play it. And we feel a personal link with Frank Zappa. He was a real troublemaker, never holding himself in for anyone or anything but just making music the way he wanted to. He didn't care if he got a few people's backs up along the way."